I hope you’re ready for another double-header and Kickstarter week because Episode 376 focuses on two excellent projects! 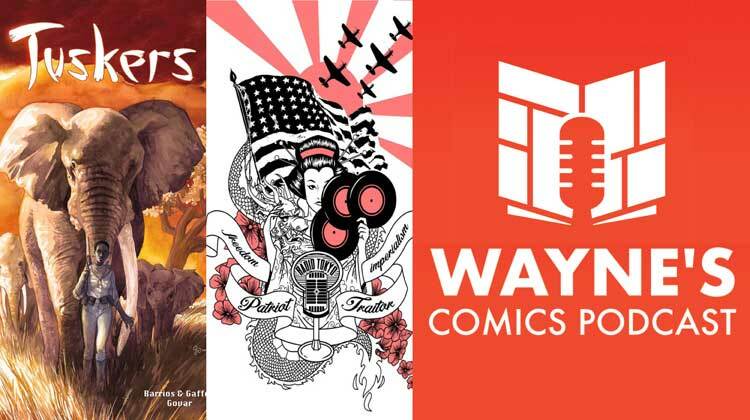 First up are Marc Gaffen and Daniel Govar, two of the creators of Tuskers, a high-quality graphic novel you can now support on Kickstarter. Com! This book is about a herd of orphaned African elephants that must escape their homeland as a vicious poaching militia chases them! We talk about how they brought this story to life as well as what we might expect from them in the months ahead. This Kickstarter has already raised its goal, so now is the perfect time to jump on to get great stretch goals! Then everything wraps up with my discussion about Tokyo Rose: Zero Hour with writer Andre Frattino and Andew Birkett from Atheris Entertainment, who is making this Kickstarter happen! Here’s the series’ quick description: “This graphic novel is inspired by the true story of Iva Toguri, a Japanese American woman trapped on the wrong side of the Pacific during WW2!” We talk about how the book came to be, discuss Iva Toguri’s fascinating story, and what other projects we can enjoy from these two creators. It’s an excellent historical story worthy of your support, so I recommend you go to Kickstarter at this link after you listen to our interview! Thanks so much for having And and I on the podcast.